We’ve been gluten free as a family now since May due to our 2 1/2 year old’s diagnosis with Celiac Disease. We’ve been adapting pretty well for the most part but there are some things that still seem to be a struggle. It’s tough to find a variety of affordable gluten free snacks and treats that aren’t full of extra junk. We don’t eat a lot of sweets but once in a while a little something special is fun. 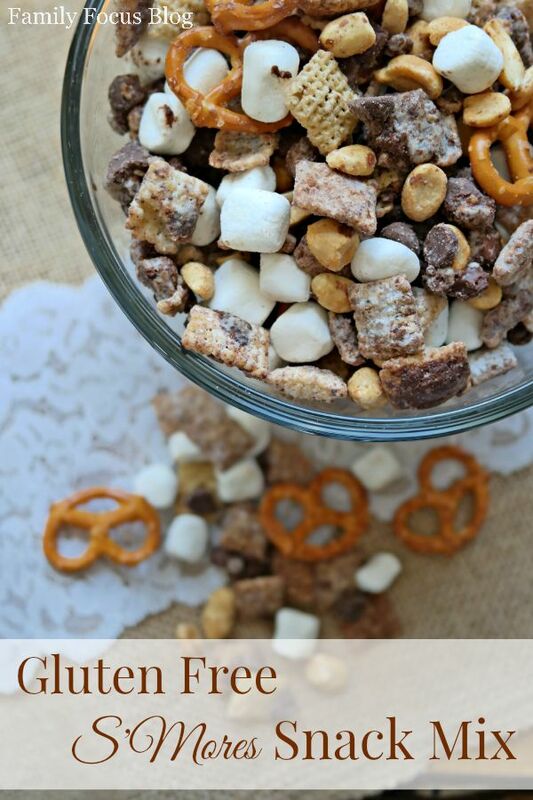 That is why I came up with this smores gluten free snack mix recipe and it has been a huge hit. We had a campfire last weekend and made s’mores and had to have our little guy skip the graham crackers because we couldn’t find gluten free in the store that shopping trip (it was right after a holiday weekend so I’m guessing they were sold out). 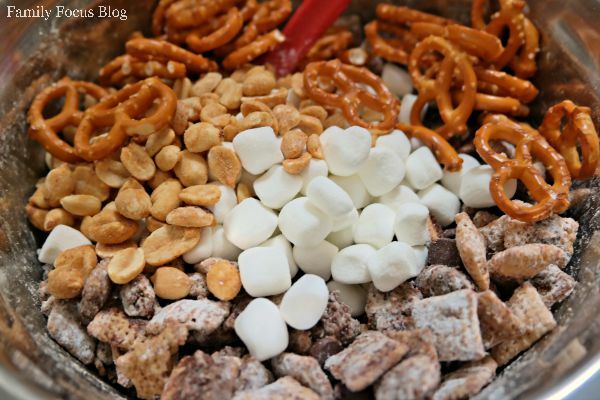 That inspired me to make this Gluten Free S’Mores Snack Mix this week so he could enjoy some of the flavors of s’mores any time. 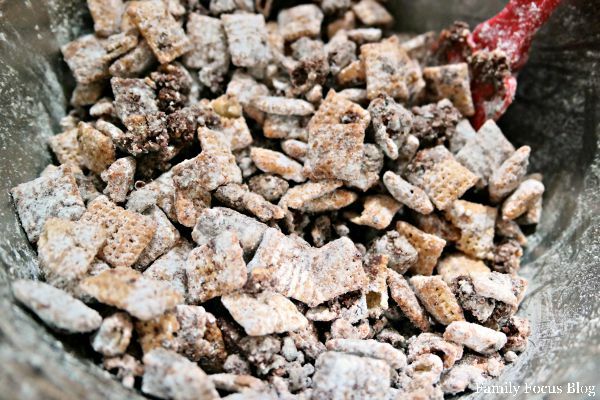 The kids all say it’s amazing, like a cross between a s’more, Chex party mix, and puppy chow! Note: Not all corn or rice cereal is gluten free. If gluten free is important to you make sure you check before buying. 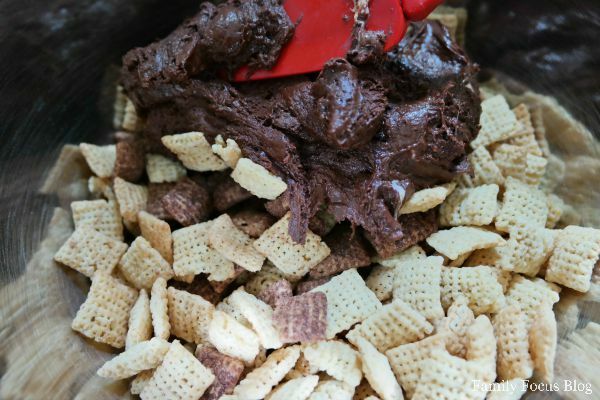 We bought the Chex brand because they are gluten free and have a variety of flavors including a chocolate mix which was perfect for this recipe. Combine 1 cup dark chocolate chips and butter in a medium size mixing bowl. Microwave on high for 30-35 seconds, stir and return to the microwave for another 20-30 seconds or until the chocolate is smooth and melted completely. Add 1 cup of mini marshmallows to the chocolate mixture, stirring to combine. Return to the microwave for another 30 seconds. Stir until mixture is smooth. Do not over heat or the chocolate will become thick and stiff. 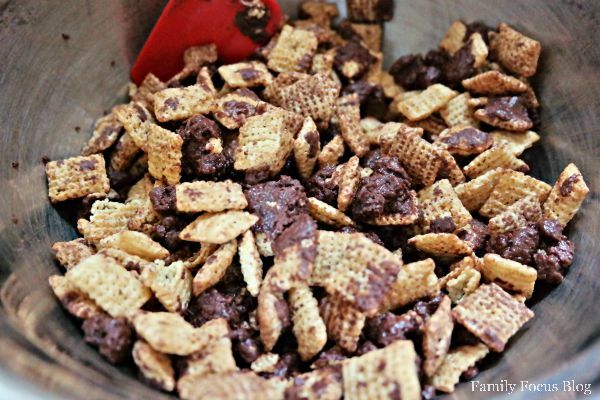 Pour the chocolate, butter, and marshmallow mixture over the 3 cups of cereal. Stir to coat but be careful not to crumble the cereal too much. Let the cereal and chocolate mixture cool completely. Once the cereal is covered with the chocolate mixture add the powdered sugar a little to a time, stirring and tossing to coat the chocolate covered cereal. Next stir in the peanuts, pretzels, the remaining chocolate chips, and the remaining marshmallows into the snack mix. You can add almost anything to this mix. Dried fruit, candy, or even gluten free bagel chips would be great additions. When the gluten free snack mix is fully combined it’s ready to serve! I’m sure everyone will enjoy this gluten free treat reminiscent of smores. The best part is you can enjoy this snack any time of day, indoors or outdoors! What is are some of your favorite gluten free snacks? 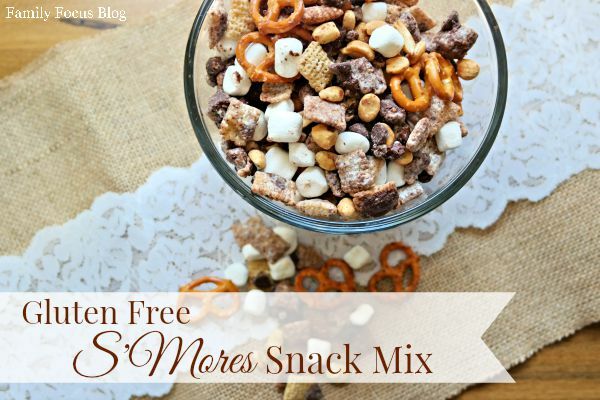 Sweet and salty gluten free snack mix that remind you of s'mores. Once the gluten free snack mix is fully combined it's ready to serve! 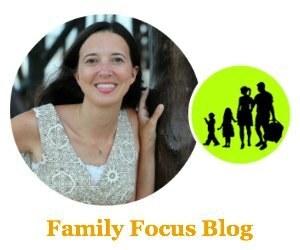 Like Family Focus Blog on Facebook for more yummy recipes and family topics! You know my love for s’mores. 😉 This looks delicious! This is awesome! We’re just starting our journey with allergies, and are currently cutting out wheat for my son. My kids will love this for a snack without feeling deprived! Thank you.